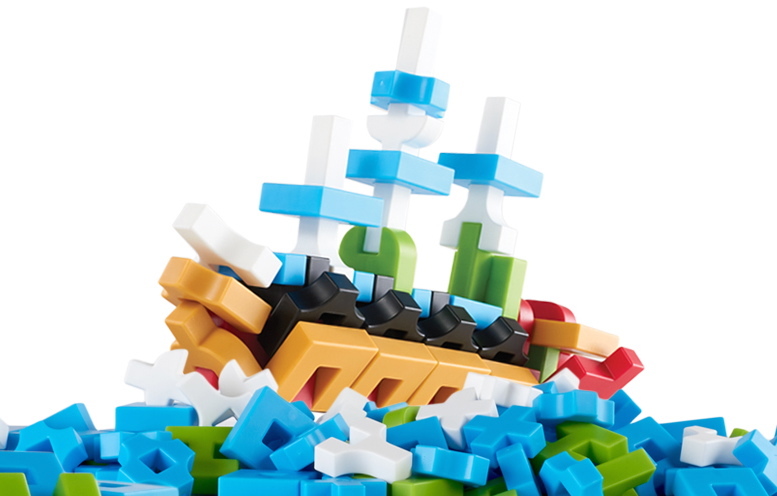 Toy and Furniture company, Guidecraft, creates digital world building appeal in physical form, with its new soft-touch plastic construction toy, IO Blocks™. "Guidecraft creates digital world building appeal in physical form"
IO Blocks™ is Guidecraft’s brand new, open-ended building toy, based on the digital world’s pixelated construction forms. To further the digital world/physical world connection, Guidecraft breaks new ground offering a chance for young builders to utilize an augmented-reality building guide alongside the new toy. In stores for the first time this season, each IO Blocks™ set is comprised of 12 unique plastic shapes in 6 colors, which interlock for limitless building possibilities. The pieces feature soft-touch plastic with a special matte finish, especially designed to appeal both visually, and to the touch, as well as to support a secure, yet easily adjustable, friction fit. All pieces are derived from .5” cube with the largest pieces measuring 1.5W x 1.5L x .5D. Curved elements on some of the shapes add to the building possibilities and encourage fluid designs. Inside every IO Blocks™ set (with the exception of the large education set), builders will also find a Tracker Pad, which works in conjunction with the free IO Blocks™ building guide App (available on Google Play and Apple App Store for smartphones or tablets). The App and Tracker Pad not only digitally replace the traditional building guide, but they break new ground, allowing builders to interact with the App, exploring exploded view animation of animals, vehicles, robots and structures at will. Various build levels from Beginner to Advanced, extend the life of toy to keep the builders of all ages, challenged and engaged as they play. 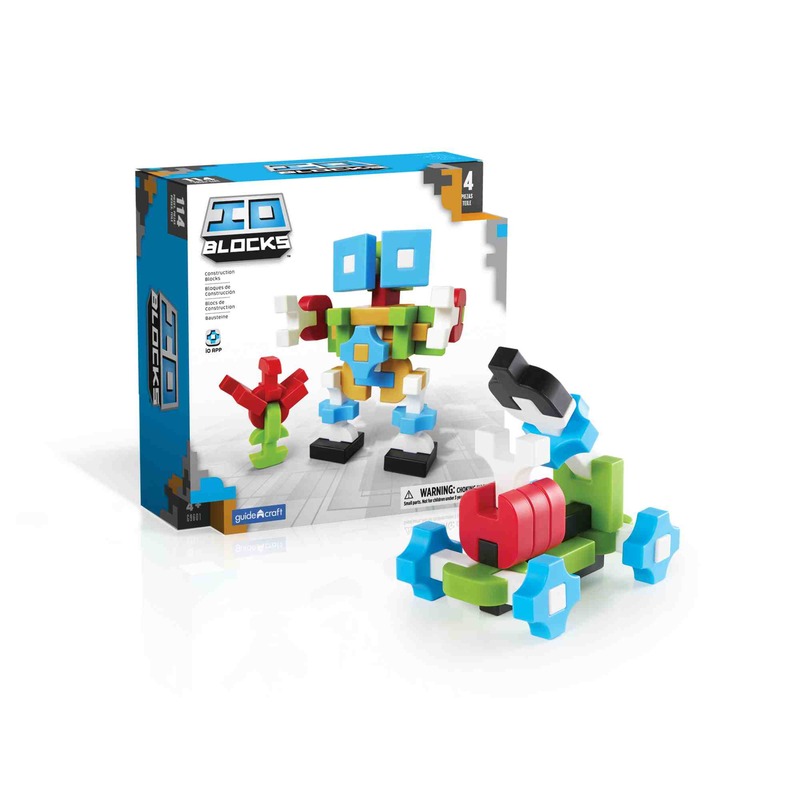 The high-quality design of the IO Blocks™ toy itself, with its open-ended building possibilities and problem solving, puzzle-like qualities, makes it a great fit for educators and parents interested in STEM skill development toys. Additionally, the augmented-reality IO Blocks App revolutionizes the way young builders can exercise their understanding of spatial concepts, while leading the industry with a digital interactive instruction guide that can be conveniently upgraded at any time. IO Blocks sets range from a 59 piece travel case to 1000 piece classroom activity set (the only set with 20 build cards for educational use). Suggested retail prices are from $24.95 to $199.95. Developmentally appropriate for ages 4+. Available at Guidecraft.com and participating retailers. In business for 50 years, Guidecraft has grown from its humble beginnings to become a global, environmentally-responsible, toy and furniture company, committed to creating fine, high quality educational toys and furniture for children in the consumer and educational markets. Guidecraft’s mission is to create objects of lasting importance that enrich the lives of children and provide creative, meaningful and joyful experiences. For more information visit http://www.guidecraft.com and follow us on Twitter, Facebook and Pinterest.